Choices are getting pretty lean here in San Diego for unreviewed fast-food restaurants that offer fish sandwiches. I’ve pretty much written about everything this side of Burger King and McDonald’s. I even browbeat a half-dozen KFCs because they aren’t carrying their “Fish Snacker,” even though it’s on the corporate website. 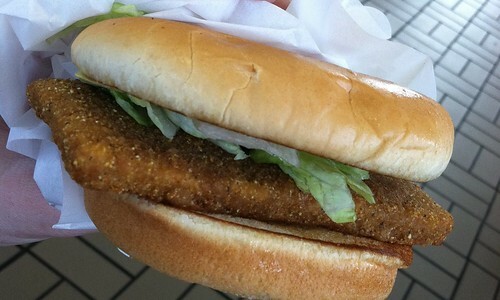 * Desperate for another new experience, last weekend I caught a flight to Texas to try the fish sandwich from Whataburger. I know I could have just flown to Phoenix — the closest Whataburger location to San Diego — but I wanted the miles. 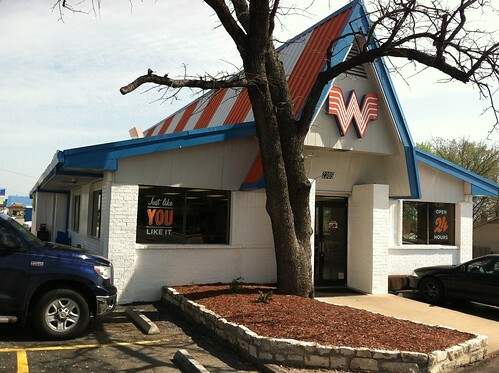 So Darlene and I touched down in Austin and before you can say “Alamo” (our rental car; I know the Alamo is in San Antonio), we were off to the nearest Whataburger. 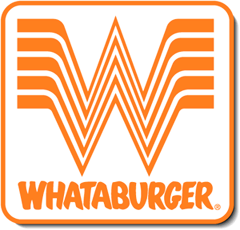 The Whatacatch is fried to order and brought out to you after about 5-7 minutes. The fish itself — Alaskan pollock — is pressed thin into a cornmeal-covered rectangle. The sandwich is made complete with a plain toasted bun, chopped iceberg lettuce and tartar sauce. The cornmeal was a nice touch and it assisted in making the fish stand apart from many other fast-food entries. The rest of the sandwich was fine, but the flavors weren’t overly memorable except for the fish itself. 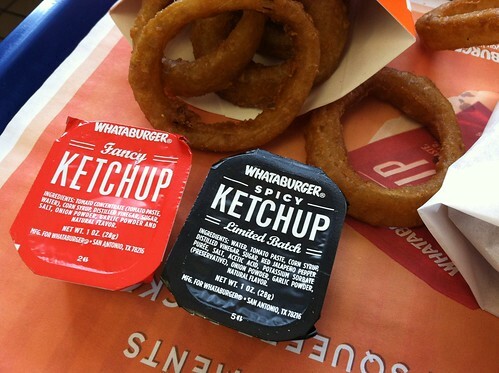 (Maybe the addition of their limited-edition jalapeño-infused ketchup would’ve made it stand out?) For $2.99 I was expecting a bit more fish for my buck (see Arby’s). I saw no indication — either at the restaurant or online — that the Whatacatch is a limited-time menu item, so it might be here to stay. You’re looking at 450 calories and 24 grams of fat for the Whatacatch sandwich. *EDIT: Not any more! They took it off their website sometime within the past month… no doubt spurred by my incessant inquiries!